Above Clinton, Iowa, the Mississippi rolls into a deep quiet that can be heard for miles. From the Main Channel, islands unfurl into backwater sloughs that rise sharply into bluffs, punctuated by the flows of tributary rivers and streams. The pace of this place seems to match the current of the river: steady but in no big hurry. As you pass through, you might be tempted to think that nothing ever happens here, but something is always afloat in river towns. 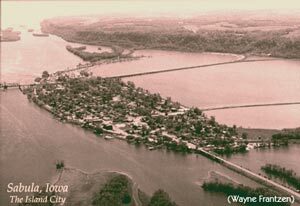 Sabula, Iowa, was a settled village of 20 years when the first Grand Excursion chugged past. It was home to a pearl button factory, a common industry in river towns, where mussels were harvested from the river to make buttons. The town was also home to the Brooks Stock Company, which ran a stock theatre and vaudeville tent show operation to small towns in the Midwest. You can get a good view of the river when you cross the Sabula-Savanna bridge, completed in 1933. After crossing the river, head south to Savanna, stroll historic Main Street or have a riverside picnic in Marquette Park. If you want to hike, camp or boat in the Savanna area, there are plenty of places to check out. The Great River Trail from the Quad Cities is scheduled to reach Savanna the summer of 2003. Mississippi Palisades State Park is just north of Savanna, and on the Iowa side, there are two units of Bellevue State Park. Both offer miles of trails, great river views and boat ramps. Just upriver, the former Savanna Army Depot sprawls across nearly 3,000 acres of prairie and backwaters. The site included munitions storage, manufacturing and testing operations. The factories at Savanna began humming during World War I, and employed 7,000 people working 24 hours a day in 1942. The installation closed in 2000, and now a large portion of the property will be converted into the Lost Mound National Wildlife Refuge. Depot lands wont be open to the public until they are cleared of unexploded ordnance. The former depot buildings now house new businesses. The town of Bellevue, even with the action at Lock and Dam 12, seems serene. But it too, has the rowdy history of a river town. Bellevue was known as a haven for thieves and counterfeiters. A particularly nasty bunch hung out at Browns Hotel until vigilante groups joined the sheriff in what became known as the Bellevue War to clear them out in the 1840s. The crooks were set adrift with only a few days supplies, and threatened with hanging if they returned.